The Imperial Russian government produced an immense volume of paperwork. In a recent article on the Russian “Graphosphere” (that is to say, the world of writing) in the early 19th century, Simon Franklin notes that as many as 30 million documents were being generated, per year, by the Ministry of Internal Affairs alone. While some of these were printed, most were still handwritten, employing an entire army of scribes to create copies of the imperial will to be sent to every corner of the Empire. 1 Taken together, this flood of written communication has done much to cement the Empire’s reputation as a “hypertrophic” state—that is, as an unwieldy and overgrown political structure determined to intervene in every possible matter, even when sending a letter was pretty much all it could do. Where did this graphomania come from? Historians have posited a variety of answers. For some, the answer lies in a “police state” culture, imported in the 17th century from western Absolutism. As they began to govern like orderly German princes, this argument goes, Russian rulers used writing to try to regulate everything. For other historians, the source of Russia’s love of paperwork lies in something more basic, namely, the Russian ideal of autocracy itself. If the will of the Tsar was absolute, and to be obeyed rather than reasoned with, then it behooved everyone involved to get this will in writing. Furthermore, the only correct starting point for any additional action—an accusation or an appeal, a protest or simply an acknowledgement of a job done—was to copy out the relevant earlier decree, before appending any new information. Thus, from this point of view, the river of Imperial Russian paperwork took its source from the lofty principle that the Tsar, God’s chosen voice on Earth, was to be heard and obeyed. Now, as it happens, the Empire’s highest officials were quite aware of this problem in the early 19th century. For at least some of them governmental graphomania was not an abstract historical question, but a constant headache, a source of organizational scleroticism that slowed all business to a crawl and prevented energetic action. And it’s interesting to note that in 1806, in the august State Council, another explanation for Russia’s addiction to paperwork was advanced: it was the fault of the Russian postal system. Whether Rumiantsev was right about any of this is, of course, a complex question. Politicians and political economists have often dreamed that postal services could pay for themselves, but in most countries (and especially large, sparsely populated countries) this has rarely been true. What is clear is that (in the 18th century at least) the Russian government maintained its obligation-based method of organizing the post at least in part because it believed that it had neither the money nor the manpower to deliver the full weight of the law by any other means. Ultimately, these legal actions tell us more about the Government’s perceptions of its needs, than about whether the root of Russia’s paperwork problem lay in its communications system. Still, it is interesting to think about such issues of process rather than principle in Russian history, and whether the hand of the Russian state was made a little heavier by the fact that its executors rarely had to pay postage. As for Rumianstev’s suggestion to commercialize the Russian post: while the idea (which had the support of other members of the State Council) became the basis for various postal reform projects over the next few decades, he himself went on to bigger and better things. He served as Russia’s Minister of Foreign Affairs and accumulated a vast collection of old Russian manuscripts and European paintings, that now form the basis of several museums. One wonders if he paid postage for them? 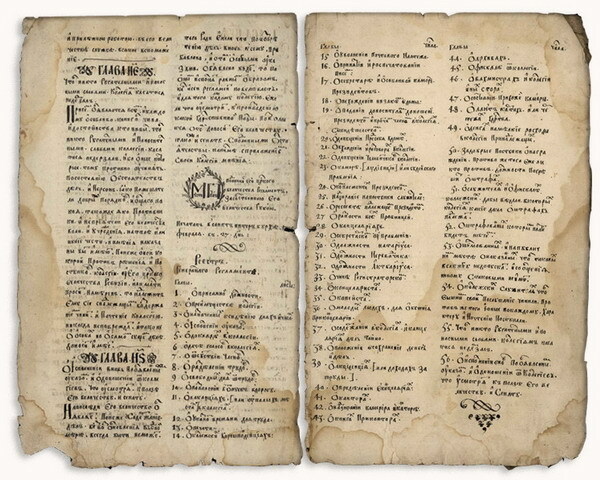 PS: The image at the top of this entry is from a manuscript copy (made from a printed edition) of Peter the Great’s “General Regulation” (General’nyi Reglament) of 1720. The copy belongs to the O. Gonchar Kherson Regional Library. John Randolph is Associate Professor of History at the University of Illinois. John, I have a question about this “unwieldy and overgrown political structure determined to intervene in every possible matter.” There seem to be two traditional yet competing narratives. The first is that for centuries Russia is undergoverned–it has too few bureaucrats and therefore cannot hope to intervene in every possible matter. As the textbook I use (Moss) argues, “as compared with Western countries such as Great Britain, France, and Prussia, Russia’s government was woefully short of personnel when Nicholas [I] came to the throne.” Every ruler since Peter is increasing the size of government, but Russia remains undergoverned. But then we have this second narrative, which you adopt, that argues the bureaucracy is too large and unwieldy. So which is it? Or can it somehow be both at once? Chronology here clearly matters, so is there a point where Russia goes from undergoverned to overgoverened? And if so, is there really no time was it was simply governed? Is the paperwork and red tape really that much worse in Russia than in Britain/France/Prussia? I would appreciate your thoughts on this matter. Thanks for the questions! My take on the “hypertrophic” vs. “undergoverned” debate–which surely exists–is that in its essence it’s one of ambitions vs. reality, or reputation (as I termed it here) versus substance. I think it is difficult to look at Russian archives of the 18th (much less the early 19th) century and say, “this is a modest, incurious state, not interested in what is going on down the ladder.” Actually, in addition to writing very detailed decrees, the government conducts very detailed investigations, to make sure the letter (and not merely the spirit) if its decrees is being followed. On the other hand, there’s no doubt that the instruments at hand for executing this purpose were very limited; the social and geographical difficulties formidable; the cadres and the local institutions just weren’t there. So in answer to the question “over or under governed?” I think it’s possible to say, “both!,” if you keep in mind the former refers to ambition and the latter to reality. And I would think that that paradox is actually part of the pathos of the history of the time. The comparative question — is Russia worse than France or England? — is more difficult to answer, I think. If one goes by absolute volume of correspondence, one would suspect that societies in which print technology is much more robust than Russia (and governmental institutions and populations are thicker) produce more paper. I wonder if perhaps Simon Franklin’s group on the “Graphosphere” has an answer to this. On the other hand, both France and England have elements of independent judiciaries–parlements and parliaments, as well as courts–which take some of the decision making power out of the chancelleries and place it in the legal realm. So the phenomena would seem to be not exactly comparable, I’d be curious as to what others have to say on this. Mostly, however, I wasn’t so much intending to endorse the idea that the Russian state was all powerful as to note that in addition to having a lot of ambition (one that often was longer than its reach), it also helped create a world in which lots of people spent a lot of time moving a lot of paper around. Some of that paper, I think, ultimately came from the fact that when in doubt, it was easier to write a lot than to be found wanting in either vigilance or obedience. As was the case in Muscovite times, many people were invested in the idea of Imperial power, even if the reality fell short. Something I’ve been noticing are moments when individual authorities chastise other authorities for excess paperwork–say when a local bureaucrat takes it upon himself to question another one, I’ve seen some very testy responses that draw on the “too much bureaucracy, too many letters” argument. Of course, my favorite thing along these lines came in a file (the citation for which I can’t immediately find) on the status of impoverished woman–a freed serf, if I remember correctly. For various reasons, it was obvious to the local authority she was asking for help that she was, indeed, impoverished. But in the process of getting approval from a provincial level authority, the locality was told that they had to do a proper check of her financial state–and so the authority (to my mind, clearly in a snit) sent letters asking if she had any property to… I think every district in the province, plus every town authority, and maybe even nearby provinces, too–dozens of letters. They got some responses, and sent out a second round of letters reminding everyone to respond. It was a very, very long delo. John, I like this idea of the hypertrophic state, as well as your answer to Jeff about the difference between ambitions and reality. In my own work, I have used “hyper-bureaucratic” to mean, essentially, the same thing. The Gulag, for example, had seven different censorship forms that camp censors had to deal with when considering whether or not to censor a letter. Seven! Considering that regulations called for one censor for every 1300-1500 prisoners in labor camps (and remembering that the Gulag was chronically understaffed and that its personnel were generally poorly educated), it’s difficult to imagine that camp censors regularly bothered with most of these forms. Indeed, I wonder if the hypertrophic state encouraged the prevalence of informal practices, as it no doubt became easier–at least in certain circumstances–to ignore or modify official regulations, than to follow them to the letter. Thanks, Wilson! That story about 7 censorship forms is rather poignant. To be clear, this idea of the Russian state as overgrown and too involved in social life is certainly an old one, and the term “hypertrophic” is not mine, but a winged phrase in the literature, see, for example, “Muscovy as a Hypertrophic State: A Critique,” in Kritika: Explorations in Russian and Eurasian History – Volume 3, Number 3, Summer 2002 (New Series), pp. 501-507, by Charles J. Halperin, with references. One thing I might add to my first comment is that “over” and “under” governed are obviously critical judgements, most obviously from a liberal / modern perspective. So perhaps the whole conversation can be thought of as too judgmental. Whether or not one constructs the debate in that way, I do think that there’s a sense in which the combination of ambition, concentrated power, institutional weakness, and pervasive limitations is characteristic rather than self-contradictory. Dealing with a lack of strong local institutions by sending out a plenipotentiary to be your “man on the ground” and get things done, for example, was a tried and true tactic. But the presence of a plenipotentiary is not going to stimulate the growth of a strong set of local institutions that can carry out the central government’s will; quite often the contrary, in fact, the governor represses local opponents, whose development (overall) might actually help central political power grow local roots. Thanks for your replies John and keep up the interesting posts! Thank you for being interested — and for reminding me not to get too lax on either the comparative dimension or questions of ambitions vs. reality. As I’m sure you know, those indeed are the frames that slip out in most traditions of writing about Russian history, for a variety of reasons that deserve an entirely separate post. One thing I might add to my first comment is that “over” and “under” governed are obviously critical judgements, most obviously from a liberal / modern perspective. Certainly that may be true, but I don’t think it’s necessarily a reason to shy away from critical judgments. Refusing to engage in critical judgment is, after all, only another form of the modern perspective–and I don’t think we really need to avoid it so much, provided that we do realize our viewpoints and outlooks will always be colored in this way. Or to put it differently, our human brains are made to evaluate and form judgments, which is what keeps debate in constant flux–no one perspective is quite the same as any other. Back to the topic you brought up: I’ve read in several Soviet memoirs that “what is written with the pen cannot be cut out with the axe.” Even if you go on to Bulgakov and The Master and Margarita , you’ve still got the ending line: “Manuscripts don’t burn!” So there’s a very deep–who knows how far back it goes–idea of the absolute sovereignty of the printed word. And it certainly makes for an interesting tangle when decrees and pronouncements happened to contradict each other. I haven’t gotten farther than that yet with my thoughts, but that ongoing tension always intrigues me–the passion for security on one hand and a sort of petty-anarchy on the other.